(Zach Walton @ WinProNews) One of the most controversial pieces of legislation currently making its way through the Senate is the Marketplace Fairness Act. In essence, it would allow states to collect taxes from online purchases even if the online store doesn't have a physical presence in the state. Brick-and-mortar stores claim the bill levels the playing field with online retailers while opponents say it would put undue regulations on online businesses while making the tax code even more cumbersome. Guess which side the White House agrees with. The Hill reports that the White House has formally announced its support for the Marketplace Fairness Act. The newfound endorsement was a key factor in the Senate voting in favor of the bill during a procedural vote on Monday evening. Do you support an online sales tax? Do you think small online businesses have anything to fear? Let us know in the comments. The idea of an online sales tax is nothing new. Retail stores, represented by the National Retail Federation, have been pushing for an online sales tax bill for years after the Supreme Court ruled in Quill Corp v. North Dakota that a state could not levy sales tax against a company if it had no physical presence in the state. Numerous online retailers use this to get around sales tax, and retail stores say this gives them an unfair advantage. "This administration has carefully considered the legislation, and our team has met with a broad array of people on the issue. And we have heard overwhelmingly from governors, mayors and the business community on the need for federal legislation to level the playing field for our businesses and address sales tax fairness." The Nation Retail Federation isn't the only group pushing for the Senate to pass the Marketplace Fairness Act. Governors around the country, including Chris Christie of New Jersey and Rick Snyder of Michigan, have voiced their support for the bill. States are hurting for revenue, and they feel that a national mandate on sales tax will bring billions of revenue back to the states. Carney echoed the governors by saying that the potential tax revenue would help states fund "K-12 education, police and fire protection, access to affordable health care, and funding for roads and bridges." Even if the bill is able to pass the Senate during a final vote later this week, it faces plenty of opposition. The Republican-controlled House is just one of the many challenges the Marketplace Fairness Act faces as it progresses through the legislature. Obviously online businesses are coming out against it. Ebay has been especially hostile towards the legislation, and has even started recruiting its sellers to protest the bill. The common complaint from Ebay and other businesses opposed is that the bill would put undue burdens on online retailers. The current tax system has created a symbiotic relationship between online companies and the states. The states attract online companies to set up a physical presence in a state through a number of perks while the company brings tax revenue and jobs to the state in question. A universal online sales tax destroys that relationship by making online companies collect sales taxes for states that they receive no benefit from. 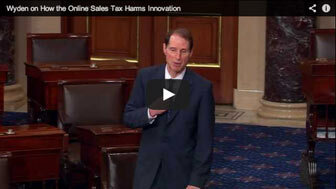 The current legislation offers sales exemptions to online businesses that make less than $1 million annually. Ebay is currently lobbying Senators to add an amendment that would up this exemption to $10 million. One company that's already benefiting from that symbiotic relationship has come out strongly in favor of the bill though. Amazon, which has a number of distribution centers across the country, says that it favors the bill because it creates a unified national framework for tax collection. Despite the Senate's overwhelming support of the bill, TechDirt points out that Sen. Ron Wyden has come out strongly against it saying that it negatively impacts innovation. "A transaction tax on financial services products will hurt retail investors, retired Americans, and small businesses, effectively making it more expensive for them to invest and plan for the long-term. Without hearings, these implications and others will not be properly addressed." Do you agree with those in favor of the bill? Or the opposition? Let us know in the comments. It should be noted that the Marketplace Fairness Act isn't a done deal in the Senate. Monday's vote was only procedural. Now the Senate will get to work on adding amendments to the bill with a final vote scheduled for Thursday or Friday. Unless something disastrous happens, the bill will probably pass the Senate without much of a fight. A glowing endorsement from the White House has made sure of that. During the debate in the Senate and the House, you're likely to see the following argument - Do we even need an online sales tax bill? Is there any real reason to throw a bone to the retail businesses that implement stupid strategies like a $5 window shopping fee. One compelling argument is that retail stores should find ways to better compete with online businesses. The retail store still has a few advantages over online businesses, but are they really capitalizing on those advantages? At this point, it's too early to tell exactly what kind of damage, if any, the Marketplace Fairness Act would cause. It could possibly do nothing, but some are right to fear that it would legitimately hurt the operations of online retailers.